Tenaciously limping along like Chester on the western TV series “Gunsmoke.” On Monday, the Institute for Supply Management (ISM) released their November Manufacturing Index report, showing a very slight contraction. 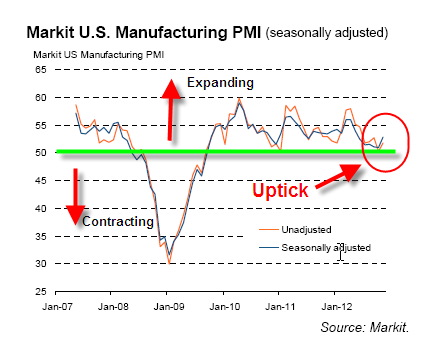 The downward trend in manufacturing activity will continue to curtail any employment gains. The monthly labor report from the BLS is due this Friday. 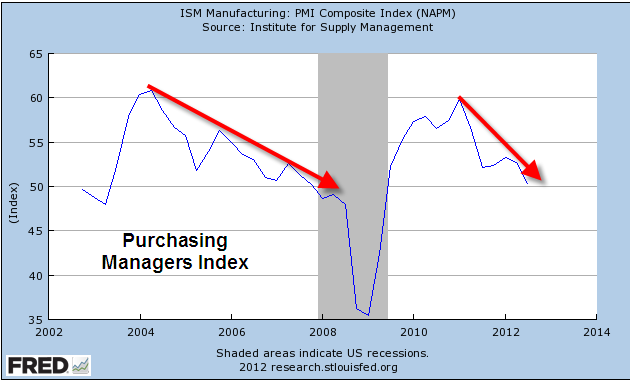 On the same day, Markit Economics and ISM released their November Manufacturing Purchasing Managers Index (PMI) report, a survey of purchasing managers at manufacturing companies. An outlook into the near future, the survey showed a solid uptick this past month, giving some hope that the decline in manufacturing may be bottoming or turning upward. For the first time in six months, exports increased; new orders and employment showed a faster rate of expansion but inventories dropped a bit, showing that businesses are still cautious. 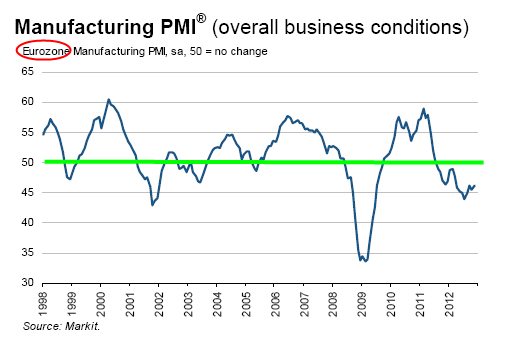 The manufacturing PMI for the Eurozone also increased but remains at recession levels. The lackluster demand in Europe will crimp growth in the U.S. The effects of Superstorm Sandy continue to muddy both the analysis of existing data and forecasting near term trends but there are no strong signs of growth.